Lanka Kade's wooden blue horse rider puzzle. This fair trade jigsaw is beautifully handcrafted from natural rubber wood. 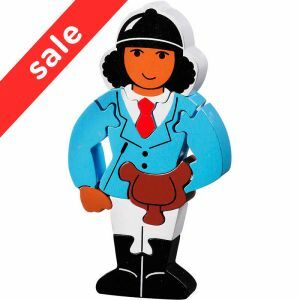 A traditional blue horse rider jigsaw is the ideal toy for developing young children's hand eye coordination and problem solving skills. This beautiful fair trade puzzle is handcrafted from sustainable rubber wood.